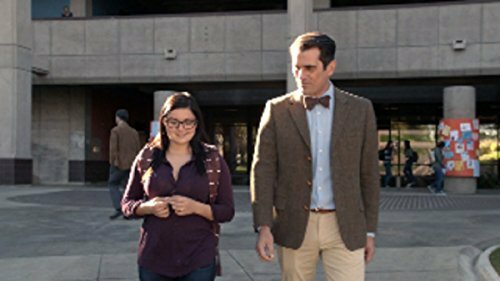 Tonight Phil goes to visit Alex at Caltech just before her first semester away at college wraps-up. He is beyond excited to have been invited. Phil: I’m going to see Alex! I’m a little nervous because she’s been pulling away lately. Calls don’t get returned. I don’t get asked to visit as much. But shortly after Phil arrives on campus, Alex opens up to him. Alex: I want to move back home and commute to school next semester. Phil: Wow. Really? Did something happen? Alex: No, it’s just the people here are all so immature. They are always banging on your door with a beaker full of margaritas, and the nerd noise is deafening. Did you bring those noise-canceling headphones I asked mom for? As Phil is promising to pick-up some headphones and drop them by her dorm room, a co-ed dressed in a ball gown comes up the street behind them. Co-ed: (handing Alex a flier): Cannon Ball tonight. Don’t miss it! Alex: Oh, it’s just some stupid tradition where, at the end of the semester, all the freshmen jump off a high dive in cheesy prom dresses. Phil: That could be fun. Alex: It definitely won’t be. Alex: No. You know what, Dad? I did. I’ve already been to like 10 parties, and they’re all lame. Everyone just talks to their own dorm mate. Phil: Sweetie, sometimes it takes a while to warm up to people. Alex: What is this about? Do you not want me to come home? Is that what this is?! Because, fine, I’ll just go get an apartment off campus! Phil: Alex, don’t get mad. Alex: Well, I am mad! Because I’m actually smart enough to know what’s working for me and what isn’t! And this isn’t! I have to go to class. It’s part of a teen’s agenda to separate from their parents – especially as they spread their wings and takeoff for college. And as Phil learns tonight, we parents have to honor our teen’s agenda to maintain our relationship with them. Yet being a parent means that we’ve had enough experience to have some wisdom worth sharing with our teens. Phil is a good case in point. This father, who has spent most of his life trying to fit in, realizes that his daughter is feeling left out at college, that she longs to be a part of it all but doesn’t know how. And his years of experience have taught him that fitting in requires that you put yourself out there and give others a chance to let you in. Phil’s first go at sharing his wisdom sounds a lot like a lecture. And Alex rejects his advice out of hand. That’s no big surprise. When kids are younger, lectures often work well for sharing our wisdom. Even if they’re in trouble for misbehaving, they listen to what we have to say. But lecturing doesn’t work as well for imparting advice to teens. To take our advice makes our teens feel dependent on us just when they’re trying to get us to see them as independent. After Alex stomps off to class, Phil decides to change course. Later we see him go to Alex’s dorm room and tell her that if she is sure that she has given living on campus her best shot, he believes her. That she can move back home. Then as he leaves he hands her a gift bag, supposedly containing the noise-cancelling headphones she’d asked for. But when Alex looks inside the bag, she finds a cheesy prom dress and goggles – the two things she needs to participate in the Freshman Cannon Ball. The point is that when his initial advice gets rejected out of hand, Phil doesn’t continue to lecture. He doesn’t try to control by refusing to let Alex move back home or threaten to cut off financial support if she doesn’t take his advice. Instead, he simply makes it easier for her to do what he wants her to do, what his own years of experience of trying to fit in convince him is the right thing for her to do: To give living on campus a little more time. At the end of the show there are a couple heartwarming moments as Alex in prom dress and goggles jumps into the swimming pool and later as she makes a late-night call to Phil just to chat. This turnaround isn’t just a feel-good (but unrealistic) ending to a TV show. It’s quite plausible when viewed from a teen’s point of view. Because as illogical as it may seem, by allowing herself to be insulted by Phil’s attempts to control her life and by rejecting these attempts out of hand, it freed Alex up so that later she could discover the usefulness of his advice. Like Alex, our teens need to push for their independence and make some mistakes of their own. They’re biologically set to do this. But as they are extending away from us, they need our input more than ever. Because from our teen’s perspective, our silence on an issue can translate into implied approval. As we saw tonight, lecturing isn’t usually the best way to impart advice to our teens. At least not on an everyday basis. Instead we can follow Phil’s example. We can look for ways to make it easier for our teens to do the right thing. – We do this when we have a few simple, clear rules and then pay attention. – We do this when we regularly stay up to make sure they get home safe, sound, and on time. – We do this when we make a point of calling before they go to a party to ensure that a parent will be present and that alcohol and drugs will not be allowed. What other things do you do to make it easier for your teen to make good decisions and more difficult for them to make poor choices? I'd love to have you become a regular reader. Join my mailing list to be notified by email of new blog posts here. And if you enjoyed this post, please consider sharing it on Facebook below. Last season ended with Phil attending Alex’s graduation celebration by a robot on Skype. At the end of that show, Andy gets set to take Beth for a drive to catch the sunset and propose while Phil tries desperately to get his attention. Phil: It’s Haley! Haley’s the girl! You love Ha– (no audio) love each other! Where are you going? You guys love each oth– You’re making a huge mistake! When the audio fails, we’re left dangling with no resolution about whether Haley and Andy will end up together. Tonight’s premiere begins basically where it left us – with Phil continuing to meddle. Again the family is all together except for Phil who joins in on speakerphone. Claire: Ahhh! That’s very sweet! Phil: It’s not sweet! Haley and Andy love each other, but they don’t know it! Claire: Whoa. (Then to Hailey) Is that true, Honey? Haley: Dad, what makes you think he’s in love with me? Phil: I could tell by the way he hugged you goodbye. Claire: Phil, are you sure about this? Phil: Claire, I think I know the look of love in another man’s eyes. Haley: This is crazy! Should I call him? Phil: His phone’s off, but he said he was going to the beach. Haley (sighing): I know what beach he likes. With that Claire and Hailey jump in the car and head to the beach where there’s more parental meddling. Claire: Oh, god! There they are. Haley: Should I do this? I shouldn’t do this. I’m gonna do this. Claire: Honey, wait, wait, wait, wait, wait. You got to be really sure of this. You’re gonna go over there and break them up for what? To hang out or to date until the next guy comes along? Hailey: Who knows? But shouldn’t we get a chance to find out what we are? To see more of Claire and Phil’s meddling, click here. The twenties have become a time for self-discovery. Like Haley, many twenty-somethings are trying to find out what they are. Some change jobs, housing, and romantic partners repeatedly. Others depend on their parents for financial support. And many are close to their parents too – texting them all day long or living in their basements. But their dependence and closeness doesn’t mean that young adults want or appreciate their parents’ unsolicited advice. Instead, our advice tends to make them feel like a little kid – which puts us parents in a tough position. We want to help our young adults avoid mistakes. But the advice we offer probably won’t be well received or heeded – even if it’s desperately needed. In general, the best advice on giving advice to a young adult is to hold your tongue unless your guidance has been requested. However, there are a couple exceptions. 1) It’s about their health or safety. If you believe your young adult’s health or safety is at risk, it’s worth speaking up even if it puts a strain on your relationship. This doesn’t mean speaking your mind if they’re simply making choices that are different than the ones you’d make if you were in control – for example, staying out later than you’d like night after night or dating someone you don’t like. But it does mean saying something if you suspect that they are driving home drunk or if you have reason to believe they are in an abusive relationship. 2) Your money is at stake. How you spend your money is one thing that you have full control over. This doesn’t mean using your money to control things that are unrelated to finances. But if you are providing financial support, it makes sense for you to set ground rules about what you will and will not pay for, and it’s important that you speak-up if the agreement is not being honored. For example, if you’re footing the bill for college, and your student is not making reasonable progress towards graduation, voice your concern. Similarly, say something if your adult child is living at home until finding a job, and you notice that they’re not looking for work. It will help your relationship if at the end of the conversation you acknowledge that the final decision is theirs. And that you’ll continue to love and care about them even if what they decide means that you can’t continue to support them financially. If you need to say something, it doesn’t have to begin with advice. Consider beginning by asking questions, but don’t make it an interrogation. Instead, try to make the tone conversational. And as you listen, try to show genuine curiosity about how your young adult sees things. If your young adult believes that you’ve listened, that you respect their right to have opinions that differ from yours, and that you recognize their interests and take them into account, they are much more likely to give your ideas a fair hearing. 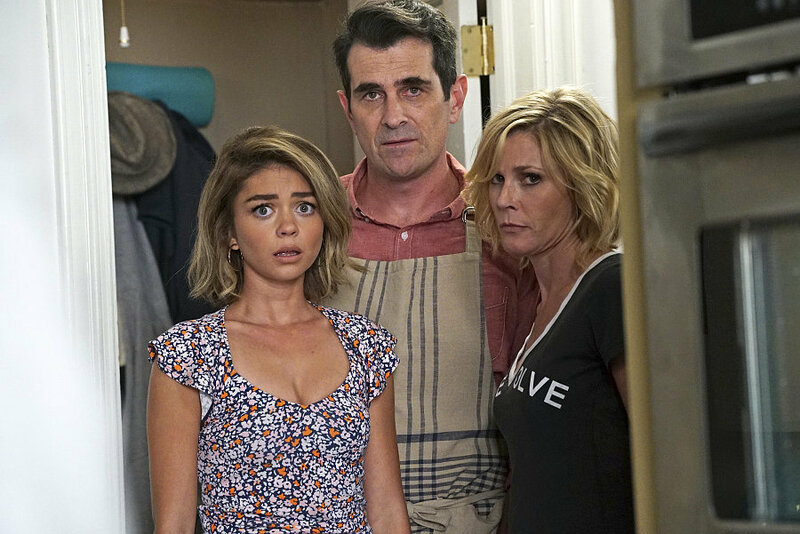 Record Modern Family and use it to connect with your kids – whether they’re teens or young adults. You might be surprised how much you’ll laugh together while watching and learn from each other in the conversations that follow. – How would you feel if you were Haley and I acted like Claire and Phil did? – Are there things I do that feel like meddling to you? – Do you think there are some topics about which a parent should have a say? Do you know how I feel about this? – If you needed some advice but didn’t want to ask me, who would you go to? © 2019 Roxane Lehmann, Ph.D. All Rights Reserved.